Model T Ford Forum: OT but good! Model T Ford Forum: Forum 2018: OT but good! Today we had a full grown Bald Eagle land on the far side of our pond.Here in farmland they are not often seen.This one sat on the rocks looking into the pond as if to get brave enough to try one of my catfish! Bud in Wheeler,Mi. The red tail hawk may run him out of town Bud. That is what happened here at my place. Not many around here either. That little hawk pestered him till he left. Havnt seen the eagle back in two years. Yes the wife got pictures but i do not know how to post them.The wife posted them on face book but i dont do that either.Bud. I'm in Michigan as well and it's really interesting how the eagle population seems to be recovering and their territories spreading more southward. For the last two years we have occasional sightings here in Livingston County. Always inspiring to see. We have them in The Woodlands, just north of Houston. Never thought I'd see them this far south. Another sign that they're doing well. I see them often here in Central Florida. Beautiful birds. 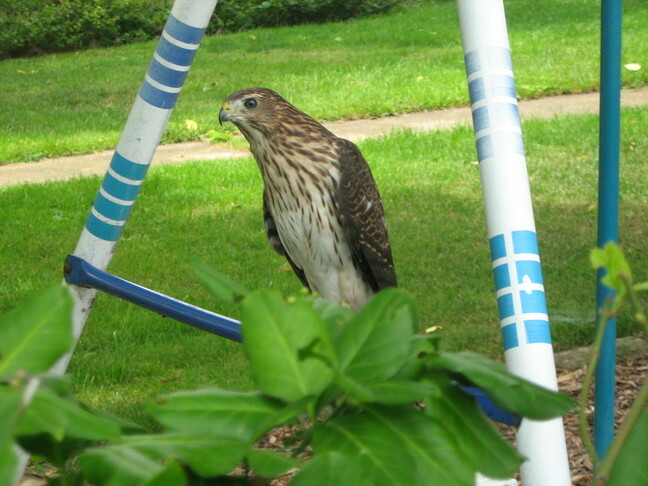 Redtail hawks around here too. When you find a fish laying on the ground and wonder how it got there, most likely dropped by one of these guys. If I look hard enough I can usually spot at least one bald eagle a day up my way. Some of them winter here and move back north in the spring. I've never managed to get a decent picture. 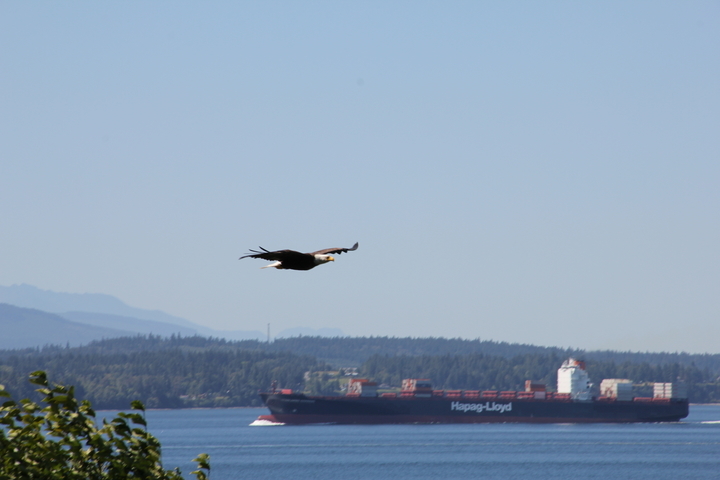 Taking a picture of some shipping in Puget Sound when this fella photo-bombed my shot! We see hunting pairs often around here. One day, I stood outside for awhile watching three pairs hunting, I could see all six Eagles at one time! Most of the time they are high enough that I cannot see the white heads without binoculars, but sometimes they see something interesting and get low enough to see the colors well. About two years ago, Linda saw one land in a tree on the property next door to us. She got a great look at it, but I was at the store and missed it. About a month later, I saw one perch in the top of a tree a little farther away. Still a wonderful sight! I have gotten a couple pictures over the years, but NOTHING as great as Sean Butler's photo! That is fantastic! That is a neat thing Kenneth. My wife often spots a full grown Bald Eagle around our property. A friend brought his Mother-in law over to see the "Baby Eagle" when we had it. All kidding aside, that is a great thing. Sir,You have left me speachles and most will say that is a good thing! Bud in Wheeler,Mi. One day I was lucky enough to catch one circling for awhile. The below video is from a holiday newsletter I did back in 2008 and is interspersed with pics of my wife's and my parents, grandparents, etc. but watching him fly is pretty majestic, just the same. Bud, I'd bet it got your catfish! Wow, I guess I live in a good(?) spot. Their population has exploded in central MN. Drive 4 miles and I expect to see one or more. They even search on the ice for bits to eat. I've seen a duckling taken away and I believe my cat Vic was taken by a bird. I had another cat stop in here that had gotten away from a bird in the middle of winter. He was ripped from his spine to his belly, just behind his shoulder. I fed and watered that uber nice, doofy cat until he was healed. He even knew what a litter box was. Boom, he was gone but lives out in these woods with his offspring. He first showed one of his duplicate offspring our place a few months ago. He remembers but won't come close. Stray cat haven. We had one, pretty sure a Juvenile, recently. Pretty rare for this part of the world, Fredericksburg, Texas. We have/had a nest north of us about 20 or so miles on Hwy 29, and some nesting on the Canyon Lakes up north. 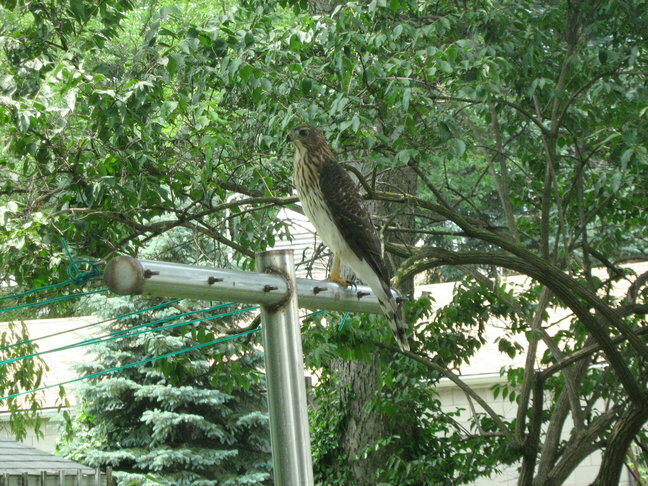 It was standing at the side of my dirt tank, looking to catch a fish, I thought it was a buzzard at first. 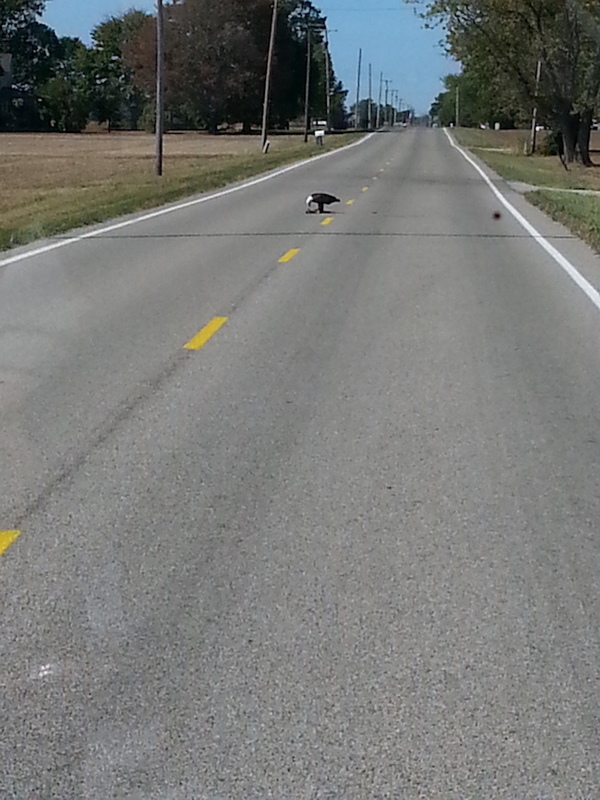 In my travels I saw them on the roads in Montana and Wyoming, acting just like our buzzards and eating the dead deer. This one never came back, hope he made it. In 2006 when we went to Alaska we saw a bizillion,but here their a rare sighting.Through efforts of one group or another we have many Coyotes ,turkeys,and every few years a Eagle. [With feathers]! Bud. PS Yes they truly are majestic!! We live about 5/8 mi. from the Snake River. There are about three nesting pairs on 20+ miles of river between Porterville and Tilden bridges. They often come and roost in our big cottonwoods in the dead of winter. Makes the chickens nervous. We see Eagles around here quite frequently. When I was a kid we hardly ever saw any Raptors - think DDT. Today it's a rare day that I don't see at least one. 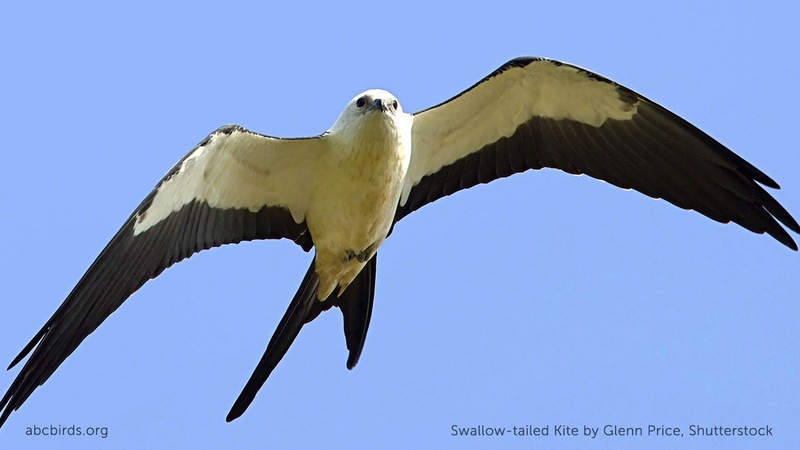 BTW - The Swallow-Tailed Kite is also here - SW Florida is just about the northernmost part of their range. They have wings that look more like a Seagull's then those of a Hawk or Eagle, and a forked tail like a Swallow (duh). They are however, a true raptor but the only member of their sub-family. If you ever see one you will never forget it. I wish that I could post a photo of one. Got this shot of one at Lake Hood Sea Plane Base in Anchorage 2 weeks ago. Couldn't believe how many we saw up there. Even at an airport. He heard the click of my camera and looked right at me. I was sharing a few things with Linda. She said I should add my photo. I took this at the Lakes Basin camping area about thirty miles from our home. It was a bit far away, and Linda had to crop, and blow up, the photo quite a bit (she is much better at those things than I ever will be!). So I hope it comes out okay. Thanks for posting the photo of the 'Kite, Steve! Several years ago my wife and I took a rafting excursion in Alaska. The purpose was to see Eagles. We floated down the river and saw many in their natural habitat. I mentioned this to a native Alaskan and he almost fell over laughing so hard. Once back in control he asked how much this cost. It was about $400 for my wife and I. He then said he could take me to a place for free to see hundreds of eagles of all sizes, and we could get up close and almost personal. A place where they do not really fear humans, a place where they are in control by sheer numbers. So it seems Eagles are scavengers and they hang out where ever there is a landfill. As majestic as they are they scavenge to feed and survive. While we did enjoy our float trip being close to their habitat, it was a bit disheartening to learn this majestic bird lives off of garbage. 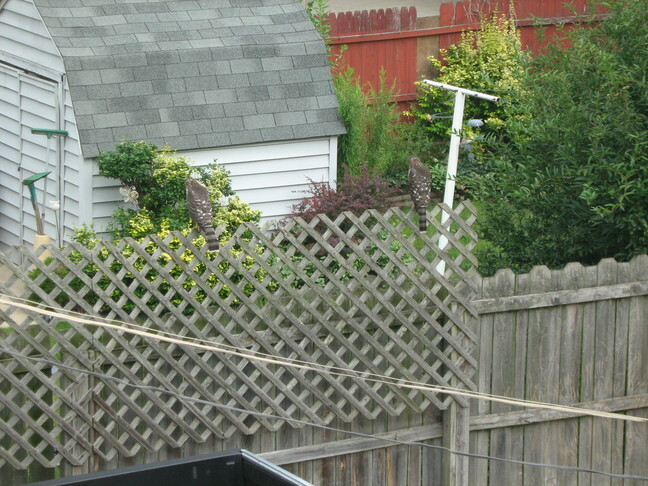 We were lucky enough to have a pair living behind our home in the country, until those damn crows drove them away. BCG: This is quite true. 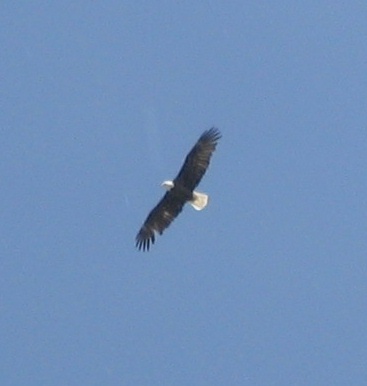 We see the most eagles when we make a trip to the dump on Whidbey Island. Of course, it makes a trip to the dump more enjoyable. That, and the other big birds from Oak Harbor Naval Air Station doing touch & goes on an outlying field about an eighth of a mile from the dump. When I was a kid we would go to the dump and watch the bears in the UP of Michigan. My wifes father once shot one with a bow in a dump and just wounded it.As told to me there were several people looking for a place to go before the bear ran offt!! Bud. Figured I might as well jump in with an eagle encounter I had driving Pete home last summer...I had to literally stop for this big fella, he was NOT giving up his dinner. Took several successive pics though, as he was kind enough to pick his dinner up and step by step move it off the road so I could (slowly) pass by. Bet I was there almost 5 minutes waiting for him! A real thrill for sure. Funny, I was just talking to my brother about eagles out west. He saw two bald eagles, they were each eating a lamb they'd killed. He started walking closer to get a picture, and they didn't move. Very close, they still didn't move. Finally, they started waddling off slowly. Brass car guy, About 20 years ago a pair of Bald Eagles was released at the Quabban Reservoir in Massachusetts. They were found a week later hanging around a dump in Connecticut. We often go boating on a couple of the lakes in the foothills of the Sierra Nevada western slope (Don Pedro, New Melones, etc.). Particularly in the fall it seems, there are many (and increasing in number) Bald Eagles. One day last year I counted nearly 40. Encouraging is the fact that over half of those 40 were juveniles. Another really neat one to watch is the Osprey. I've watched them at Pinecrest Lake (in the Sierra Nevada Mountains) while they feed. Those darn things circle, dive, then pluck a trout out of the water just as slick as can be. The really amazing part is that once they have the fish in their talons, by the second flap of their wings that trout is pointed forward, nose into the wind. It's just astonishing.